There are seven legislative assembly constituency in Bahraich district for the 2017 Assembly elections. They are 286 Bahraich, 282 Balha, 288 Kaiserganj, 285 Mahasi, 284 Matera, 283 Nanpara, 287 Payagpur. When Uttar Pradesh assembly election 2017 is getting ready to electios new Assembly, Bahraich is not anywhere behind in the election heat. Bahraich District (Hindi:जनपद बहराइच, Urdu: ضلع بہرائچ) is one of the districts of Uttar Pradesh state of India, and Bahraich town is the district headquarters. 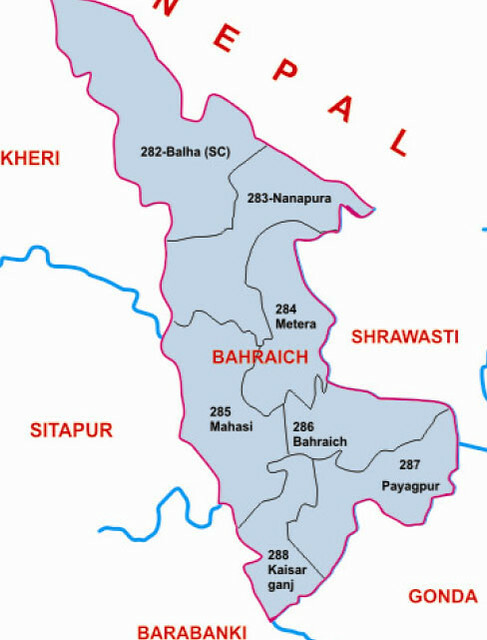 Bahraich District is a part of Devipatan Division.